By Araceli C. Hidalgo, ph.D. 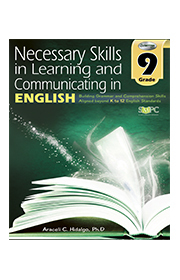 The series Necessary Skills in Learning and Communicating in English, is designed for the student who aims to learn and apply the necessary academic English language skills for secondary and higher education and the general work place. The Grade 7 edition lays the foundation needed by the learner to perform at the higher levels. There are features of this book that are not usually found in English textbooks. These are discussed briefly here to help the learner make better use of the book. Necessary Skills in Learning and Communicating in English is a series that addresses the problem of learners of English as a foreign or second language who need to access information through English in various academic fields. Specifically, each of the books focuses on the components of language learning: comprehension and communication, which could be oral or written, interactive or discursive. This is imperative in an academic system where informational courses such as Science and Technology are taught in English and in a world that uses English in the workplace. 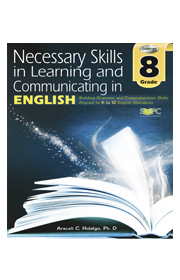 While Book 7 of this series lays the foundation of the English language courses at the secondary level, Book 8 follows seamlessly in an interdisciplinary approach but focuses at a higher level of fluency of expression in communicating and of comprehending expanded discourse. 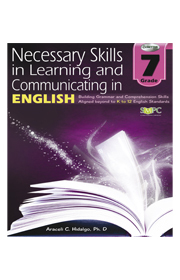 Necessary Skills in Learning and Communicating in English is a series that addresses the problem of learners who need to interact and access information through English in various academic fields. Specifically, each of the books focuses on two components: comprehension of linear and graphic texts, which includes viewing comprehension, and communicating, which could be oral or written, interactive or in discourse, which are required of secondary and tertiary level students. 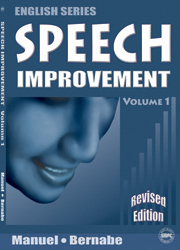 Hence, there are two general expectations of the learners of English in the series: (1) the demonstration of comprehension of linear and graphic texts and the production of extended speech, which could be in the form of an interaction of some length like discussing a topic or interviewing, or in the form of a formal discourse such as explaining, narrating, or describing; and (2) the demonstration of comprehension and the production of grammatical, coherent, and concise sentences beyond the simple basic structures of the language, as this is the foundation for the first expectation. The content of materials that are used to develop academic cognitive skills for comprehension and communication were chosen from the fields of: Earth Science, to understand typhoons and other natural phenomena and sharpen viewing comprehension; anthropology and the prehistory of mankind, to learn the need for adaptation in order to survive, and expose the learners to the probability that there are ways of collecting information other than sourcing from library materials; geography, to locate places, describe locations, comprehend geographic visuals, and follow directions; general science, to learn the relation of hypothesis and supporting evidence and probable discourse structures; literature, to enjoy how poets narrate or how they express their protests, and to develop skills in interpreting implied meanings; economics, to understand valuable character traits in the workplace; ethnicity, to understand and develop a sense of community; and humanism, to learn ways of sharing oneself. All this is bonus. The main objective is to learn how to learn and how to communicate in English through the knowledge of features of the English language, acts of communication, and discourse structure. By Dr. Bilbao, Prof. Ricky Magno & Edna Dominguez. Integrated Science Power introduces the fundamental concepts and processes of the interrelated disciplines of biology, chemistry, physics, ecology and environmental sciences, and earth and space sciences. The lessons are introduced in an integrated manner for your analysis and to solve problems and think creatively. These are necessary to make informed decisions needed to sustain quality life and protect and conserve our resources. This book contains information, learning activities, and assessments appropriate for basic education in the secondary level. It incorporates current science ideas and provides you dynamic opportunities to investigate by yourself or in a group. Integrated Science Power illustrates how science is understood through various ways of learning, preferably through experiential approaches. Incorporated in the main text are developmental questions to draw your interest and to make you think beyond what you read. There are suggested activities for you to do at the end of every chapter, which aim to challenge you creativity and critical thinking. 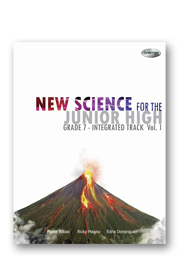 This book provides you the initial steps to the next higher level of understanding biology, chemistry, and physics in high school. It is set into two volumes as a way of helping limit the weight of your school bag that you carry daily, and thereby keep you from health hazards posed by overweight bags. 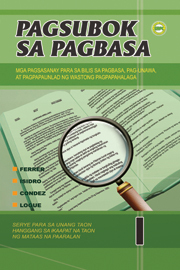 By Lagrimas L. Briones, Vilma F. Templora,Ignacio S. Tibajares Jr. Knowledge of chemistry will lead us to the understanding and awareness of the impact of manʼs activities to the well-being of our environment. Chemistry is a discipline that encompasses many aspects of lifeʼs relationships with the ecosphere. Man should be equipped with the knowledge of how to make the most out of the earthʼs resources but at the same time safeguard its richness and maintain its state of homeostasis, otherwise we plunge into the sea of oblivion. Chemistry works on the microscopic, semi-microscopic, and macroscopic levels (e.g. from the minuteness of the cell to the full blown mature human being, and from the smallest quarks to the annihilating nuclear bomb). Chemistry touches all aspects of our lives. Chemistry is such a gigantic ﬁeld of learning and cannot be held simply on the palm of our hands. Chemistry books have evolved in so many nomenclatures such as Chemistry in the Environment, Chemistry in or Our Changing Times, Chemistry and Society, Chemistry is Fun and Chemistry for Today. 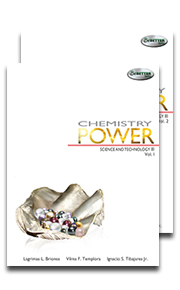 Now, we introduce Chemistry Power, a textbook designed for high school Chemistry. Modern Mathematics is a series of four volumes of text designed to meet the learning needs of the both the secondary school students and teachers. It presents the basic mathematical ideas in such a way that will make the learning very interesting and enjoyable to the student. 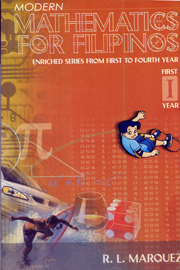 It aims to give the Filipino youth the knowledge, skills and techniques in coping with the mathematical problems in daily modern day situations. Pagsubok sa Pagbasa ay inihanda bilang tugon sa pangangailangan magkaron ng isang impormal na pagsasanay at pagsusulit upang tukuyin ang pag-unlad o paghina ng kasanayan sa pagbasa ng mga estudyante sa Mataas na Paaralan. Layunin din nitong magturo at maghubog ng wastong pag-uugali at pagpapahalaga. Ang mga seleksyon o babasahing nakapaloob sa aklat na ito ay maingat na pinili upang matiyak na ang mga ito’y makatutulong sa pag-unlad sa pagbasa, pag-unawa, at pagkatuto ng mabuting asal. Ang mga layuning ito ang dapat laging isaisip sa tuwing susuriin ang mga iskor ng bawat mag-aaral. The first requisite in learning a foreign language is getting aquainted with the sounds peculiar to the language. This is not easy to acquire since the activity involves producing sounds which are different from those of the student’s native language. The task become doubly difficult considering that English is not spoken in the same manner that is written. There is nothing that systematic and persistent practice cannot develop in the learner and in the end be acquired by him. Through constant hearing and systematic repetition the student will gradually become familiar with the sounds of English and eventually produce them with accuracy and case. A great deal of time and effort should be given to correct pronunciation at the start. This is important in undoing whatever wrong speech habits have been acquired. 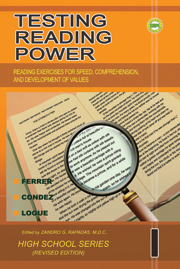 Testing Reading Power is a set of reading exercises prepared in response to a felt need for an informal test to appraise growth in the reading power of high school students, and to provide them with readings that develop not only their reading speed and comprehension but also their character and sense of values. The reading activities contained in the exercises are systematically directed to ensure growth in reading skills, abilities, character formation, habits, and interest. Also provided are instructions and tools on how to compute for the speed rate and comprehension rate of each student and in plotting the student’s progress over time.